This past weekend, Nik and I were blessed to be able to travel to Alaska for my sister Rachel’s wedding. We had a great time being with all of my family, including the SIX grandkids(!! ), and the wedding itself was beautiful. Rachel was gorgeous! 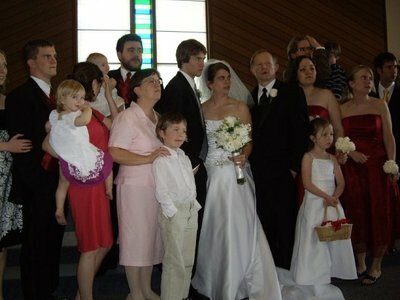 It was very interesting to me to observe the different way that Drew’s family reacted to the wedding compared to ours. Rachel was the last of our five kids to get married; Drew was the first of the five in his family. We were very excited but almost nonchalant in our handling of the wedding – we know the drill, how it goes, how great it is to have another family member, etc. Drew’s family, on the other hand, seemed quite nervous and even upset. Not because of Rachel, but because they faced a great unknown. What will life in the Mickler family be like with another family member? A life with someone married to their eldest son? Observing them helped me remember what it was like when Eric and Meggan got married. We were pretty scared. Scared to see what would happen to our very tight family unit. Unsure of how Meggan would fit into the Judge paradigm. Not knowing if Eric would essentially be lost to us forever. Trusting that the awesome Meggan we had known up to the point of the wedding would continue to be awesome as Eric’s wife. All of our apprehensions and fears had nothing to do with Meggan. NOTHING. They had everything to do with the unknown. We loved being the way we were. We knew how to relate to each other. We didn’t know how it would be with another voice, another personality, another body at the dinner table. Being still a relatively newly married wife (11 months on Friday! ), I know that grafting is not easy. It involves cutting, pushing together, figuring out what’s important and what’s not. But I also know that grafting can produce a stronger tree and better fruit. So the Judge family sends its blessings to the Mickler family. We know you will love Rachel and will treasure the blessing of having her in your family, just as we treasure the blessing of having Nik, Meggan, Leah, Katie, six grandkids and now Drew in ours. that was beautiful laura.and wow. what a great way to look at it.i’m pretty pleased with our fruit. What a nice way to say it, Laura. I quite agree. Change is always hard, and this was a big change, probably bigger for the Micklers than the Judges. Spot on. You expressed that beautifully for us all, Laura. Thank you!